Among the many storage unit types available today, drive-up storage is one of the most preferred. More and more storage facilities are finding ways to make this convenient option available to customers. It is a popular choice at the majority of our own Bargain Storage facilities, with locations in the Phoenix metropolitan area as well as the Houston and Dallas regions. 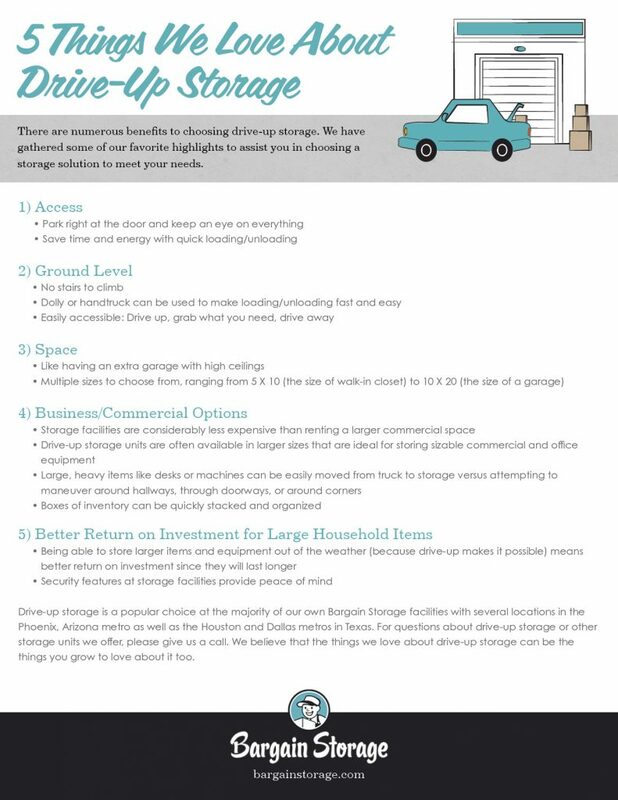 There are numerous benefits to choosing drive-up storage. The appeal is clearly in the fact that getting in and out of a vehicle to go in and out of a building can really be more of a hassle than you might expect. While indoor storage units also have their benefits, many customers enjoy being able to drive up, grab what they need or unload quickly. Being able to park right at the door of the unit and keep an eye on everything between the vehicle and the storage unit is a huge advantage. This is especially true for anyone with small children. The other access advantage is the amount of time and energy saved by being able to quickly unload straight into the space or duck in and grab needed items in a flash. Drive-up storage means there are no doorways to squeeze through or hallways to maneuver. You simply drive up, take care of business, and drive away. Ground-level access makes loading and unloading items with a dolly or hand-truck quick and easy. Because many drive-up units are so spacious, they are likened to having an extra garage, often with high ceilings. The space to keep things organized and easily accessible can feel like a luxury. Storage facilities often offer multiple sizes to choose from, ranging from 5’ X 10’ (the size of walk-in closet) to 10’ X 20’ (the size of a garage). When it comes to business, the timesavings of drive-up storage can mean significant savings in labor costs, too. And, because storage facilities are far more economical than renting a larger commercial space for inventory or equipment, many of our customers are delighted to transfer their business and commercial items. Some of the larger drive up storage units can be ideal for storing sizable commercial or office equipment. Large, heavy items like desks or parcels can be easily moved from truck to storage versus attempting to maneuver around hallways, through doorways, or around corners; and, boxes of inventory can be quickly stacked and organized. This final benefit is one of the best-kept secrets of storage unit use. When larger items, such as boats, kayaks, yard equipment, or outdoor furniture are kept outdoors, even covered under tarps, the wear and tear from the elements is severe. Gears and cranks rust, wood swells and cracks, and even plastic is weakened by the cold, heat, and sun. Being able to store larger items and equipment out of the weather (because drive-up makes it possible) means better return on investment for these big ticket items. Being able to put off replacing these items for years longer than if they were stored in the elements is a huge cost savings. And, for these important investments, secure storage facilities means peace of mind as well. 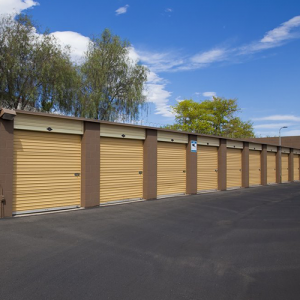 For questions about drive-up storage or other storage units we offer, contact us or find a storage location near you to talk to one of our friendly and helpful property managers. We believe that the things we love about drive-up storage can be the things you grow to love about it too.